Rosana joined the TSO family in 2016 but first entered the optical world in 2011 as an optician. She enjoys using her love of style to help customers choose the perfect frame for them. 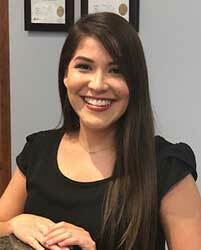 Originally from the Victoria area, Rosana moved to San Marcos in 2011 to attend Texas State University, and graduated in 2014 with a degree in Education. Her areas of expertise are in explaining insurance benefits and teaching patients about all the different types of lens and coating options that are available to them. When not at the office, Rosana likes to spend her time working out, travelling and enjoying all that San Marcos has to offer, especially the river!